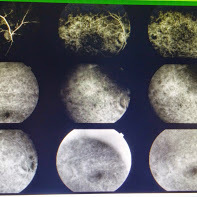 45 year old presents 20/50 vision OU has the following funds exam. Refraction could not improve the vision. OCT of the macula and FA are attached for your review. This patient was also deaf and mentally sub normal. 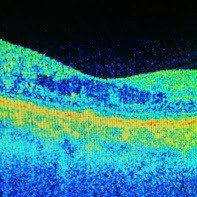 Describe the fundus picture and OCT findings and correlate to the FA findings. What is the diagnosis and what tests can confirm it. The fundus picture suggest diffuse deep retinal white dots or flecks with waxy discs and narrow blood vessels. 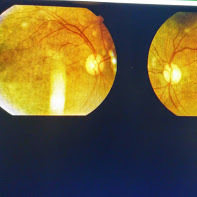 OCT of the macula suggest macular edema while the FA does not demonstrate any leak in the macular area. ERG and kinetic visual fields are the suggested tests to both help in the diagnosis and prognosis. The condition is typical of Retinitis punctata albescens. ERG would suggest reduced a and b waves as this is a disease of the photo receptors. The b waves are characteristcally prolonged in time as well as diminished in amplitude. CME with dry maculr change on FA is sometimes responsive to oral acetazolamide or intra vitreal kenalog injection. RP can be inherited as an AD (20%) AR (20%)or X linked (10%). The combination of congenital sensorineural deafness with RP might suggest Usher syndrome which is an autosomal recessive disorder.